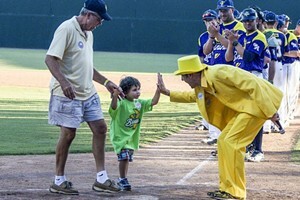 Just two short weeks from the publication of this issue, Savannah baseball fans – and fans of kitschy cool entertainment – will congregate at the temple of Historic Grayson Stadium to usher in the third season of Savannah’s great new success story, the Savannah Bananas. The Coastal Plain League team – a college amateur summer league outside the NCAA umbrella – won the championship their inaugural year, and made it to the playoffs last year. Along the way they have become one of Savannah’s hottest entertainment tickets. And team owner Jesse Cole is frank that it’s all about entertainment – the name of his company is Fans First. “We’re in the entertainment business. Before doing anything we always ask, is this entertaining, fun and different? We realized you need to create attention. And attention beats marketing 1000 percent of the time,” Cole says. Cole’s success with the Bananas is accompanied by the publication of his well-received new motivational book, “Find Your Yellow Tux,” a reference to his distinctive game-day garb. It’s also a very special season for Cole as he and wife Emily welcome Maverick, a new son, to the baseball family. 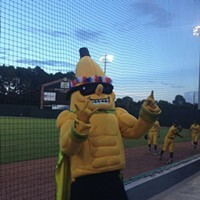 Opening day will feature the Bananas facing the Macon Bacon, a brand-new team in the CPL.